I’ve found that between the intense battles of Super Smash Bros Ultimate, and stress-inducing runs of Dead Cells, that I yearn for calming experiences on my Nintendo Switch that allow me to unwind from a long day at the office. I found Zen from an unlikely source: a unique form of jigsaw puzzles inside a gorgeous game entitled Glass Masquerade. It’s the perfect fit! 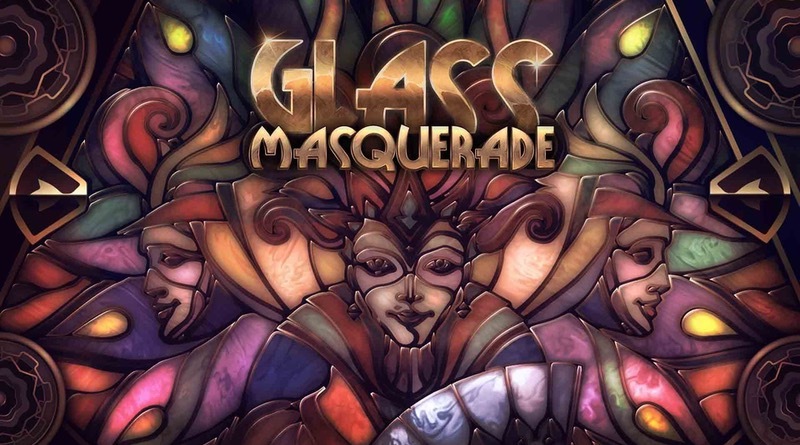 Glass Masquerade brings art deco inspired stained glass to your fingers in the form of jigsaw puzzles set against various clock backdrops with an interesting gameplay delivery. You see, unlike your typical jigsaw that generally has many similar shaped pieces and you can see the snippets of art on each, this title approaches the puzzle pieces differently. Here you’ll be presented instead with unique shapes all in silhouette form. As you select a piece, it’ll flip around and about and at that point you can place it on your puzzle area. At first, I was a bit annoyed by this mechanic. I was always having to select a piece just to reveal a bit of its art, but I soon realized that given the nature of the stained-glass pieces, this silhouette & piece design was aptly more useful than seeing that piece of art all the time. I was engaged more with the shapes rather than trying to match colors, as you would do typically with a puzzle. Unlike a traditional boxed puzzle, here you don’t know what image you’re creating beforehand at all. Coupled with your pieces effectively being face down, I found far more enjoyment in the reveal of the image once completed. Every puzzle you’re putting together happens to be a stunning stained-glass piece inspired from the art deco period. There’s beautiful craftsmanship in all of the designs, and the use of some clever parallax makes each puzzle shimmer and feel alive. In fact, for a game based on a more or less stagnant activity, there’s a surprising amount of liveliness to it all. The front-end UI has some fun mechanical pieces that animate as you scroll around the world map, revealing each of the countries in which you’ll be working on puzzles. There’s a respectable aesthetic to the entire game that’s entirely cohesive and striking. When dealing with puzzles, particularly when you don’t have a massive table to lay out all of the pieces, there comes the challenge in how you present this array of interlocking fragments to the player. Glass Masquerade achieved both a cosmetically appealing and functional system by using multiple turntables. Simply scroll through these to locate the pieces you want followed by a drag and place mechanic either via the Touch Screen or Joy-Cons. It’s just another defining example that I truly appreciate having both interfaces accessible. In my time spent piecing these puzzles together, I found that in fact I only had one lasting grievance with the game. Puzzle pieces you select have a rather thick shimmery border, and that makes the pieces appear larger than they are. While the placement area also uses that same border around all the edges of pieces you’ve already placed, resulting in smaller looking areas than you actually have. The consequence is that pieces look severely larger than where they actually fit, which can heavily throw you when matching shapes on more difficult puzzles. I’d have loved for an option to turn these border strokes off entirely. As an entire experience though, Glass Masquerade delivers a fulfilling and certainly beautiful jigsaw puzzle game to the Nintendo Switch. It’s not too difficult and I think I was on target for completing the game in around 5 hours or so. If you’re in the mood to chill out, listen to a great mellow soundtrack provided in the game, and build some elegant puzzles, you’ve got a solid purchase here. Glass Masquerade delivers an accessible, clever and elegant jigsaw puzzle experience with stunning art deco stained-glass pieces to be built. The game performs great on the Nintendo Switch utilizing both main control methods, and I only had one minor criticism of the gameplay. In the end, I’d love to see more content added to really bolster the lasting appeal for this game.